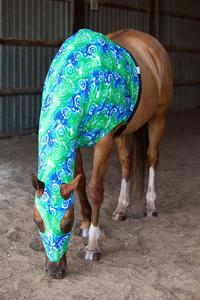 Dun Haven offers the finest in lycra horsewear: excellence in fabrics, craftmanship, friendly service, and FAST shipping. 30" YKK custom made COIL sport zippers for ease in dressing your horse(making it a snap to place bands and braids in the perfect position!) Coil zips are self-healing and much more reliable than the conventional zippers with teeth. These zippers are used in high-end luggage! TOUGH!!! Tough Nylon Zipper Guard protecting the zip from rubs & stall doors! All seams are double reinforced using tough ISACORD 100% polyester DURABLE embroidery thread. Seams are stitched and top stitched with a beautiful and reliable stretch stitch leaving all seams with four thread sturdiness. NO POPPING SEAMS! Extra large perfectly placed eyeholes - completely hemmed and finished with a gorgeous stretch stitch...absolutely no unraveling...no rubbing or discomfort! Center yoke keeps Dun Haven Hoods in comfortable position. 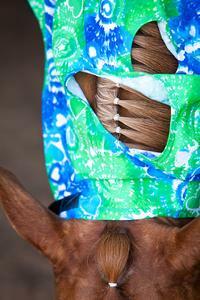 Cut EXTRA LONG...no creeping up over the withers when horses have their heads down. Sturdy side release, low profile buckles. Adjustable 2" wide heavy elastic girth. Velcro tab over the zipper pull allows for perfect fit of the muzzle. Artisan detail on EVERY hood! Hand cut individually, no mass production. Includes a matching tailbag with small, medium, large and X large sizes. Professionally packaged including care and laundry instructions. Made with premier American products. 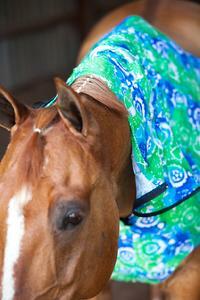 Dun Haven LLC has been creating lycra horsewear for over twenty five years. 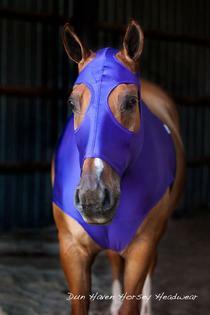 Starting out with hoods for their own show horses, they have been perfecting their original, user-friendly design ever since. As requests for these hoods from fellow competitors grew, Dun Haven began offering Dun Haven Horsey Headwear at various breed shows. Popularity has grown for these high quality, economical hoods, and Dun Haven Farm LLC is shipping hoods nationally and internationally. Dun Haven Horsey Headwear is used exclusively by many trainers, show barns, association year-end awards, and equestrian teams worldwide! Dun Haven Hoods are made in America with premier American made components. These hoods are more of a custom item; individually cut and sewn with absolutely no mass production. Our seamstresses are detail oriented and care about the product you will receive. You will enjoy the quality of the fabrics and the excellence in construction of these hoods...all at a reasonable cost. 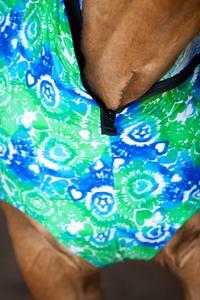 Spoil yourself and your companion with a Dun Haven Hood...see why Dun Haven is the professionals' choice! Two styles of hoods - No zipper at your request. The perfect gift for horse owners. FAST USPS Priority shipping with tracking number! Ordering is safe and easy with our PayPal shopping cart OR call to order with credit cards. Give Dun Haven a try today for Comfort, Convenience, & Durability!